Capitalizing on the fact that with the start of a New Year, a lot of smokers will set a resolution to quit smoking, Public Health England (PHE) has launched a campaign encouraging smokers to attempt quitting with the help of electronic cigarettes. Thanks to the widespread use of e-cigs, the UK is now boasting the second lowest smoking rates in Europe and the lowest ever reported locally. Brexit may provide a boost for the electronic cigarette industry as it could allow ministers to slash red tape which dictates the size and strength of nicotine refill containers. The use of e-cigarettes, widely known as vaping, has proven popular among those who wish to kick the habit as they contain nicotine but no tar or smoke. The devices heat up liquid nicotine, known as e-liquid, until it becomes vapour which is then inhaled by the user. First off, if it’s not too late, a happy new year to all and for those who have seen the new Star Wars movie, let the Resistance to public misinformation about tobacco harm reduction intensify with the growing Force of evidence. (OK that’s enough). And to see in the new year with a bang, is a very welcome development. It’s very hard not to be rather smug about the overall UK response to tobacco harm reduction. It would be great to be able to report on the publication of ground-breaking reports from equivalent overseas bodies to Public Health England and the Royal College of Physicians or supportive statements from other globally respected medical journals like the British Medical Journal. As 2017 drew to a close, smokers would have been making plans to switch, vape businesses and cigalike companies would have been thinking about the next steps they were going to take, while politicians and advocates weigh up how to push for more support for their point of view. British vapers will have filled a dripper or a tank in the knowledge that things can only get better. In October 2017 the Centers for Disease Control and Prevention (CDC) submitted an information collection request titled “National Notifiable Diseases Surveillance System” to the Office of Management and Budget (OMB) for review and approval. The OMB subsequently requested comment from the public to determine whether or not the collection and evaluation of information generated from the CDC’s National Tobacco Prevention and Control Public Education Campaign (“The Campaign”) should continue to receive funding. 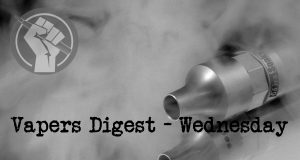 America’s news channels lit up with negative vape stories last month, with the majority of them focussing on children and schools, and even the most hardened sceptic might suspect there was a coordinated campaign at work. Links to drugs, mentions of vaping in classrooms; America’s parents are being given something new to really fear. For reasons only known to the respective news editors, the news of a student being caught vaping in a changing room was deemed newsworthy enough to make it into Illinois’ local newspapers (and feature on the associated websites). “Sandburg Student Caught Vaping in Locker Room,” cried the headlines in a way that would never happen in a million years whenever a British child is caught smoking behind the bike sheds. A man shot and killed last month by police in New Mexico was holding a vape mod that was mistaken for a weapon, according to police. The man, 35-year-old Frankie Anchondo, was killed Dec. 20, according to KOB-TV in Farmington, NM. He had been involved in a high-speed chase with a Farmington Police Department officer. According to the New Mexico State Police — who investigated the shooting — a Farmington PD officer observed a woman screaming from Anchondo’s truck as it passed an intersection. The officer attempted to pull the vehicle over, but Anchondo refused to stop and weaved through traffic to avoid the police. Are you 13 years old? Or a blue collar worker? Are you sober? Would you be willing to work 10-12 hours breathing secondhand smoke? How about vaping on camera? You can be a star, baby! A Los Angeles casting company is looking for actors to star in new anti-vaping ads being produced by the California Department of Public Health (CDPH), probably as part of the agency’s Still Blowing Smoke campaign. We applaud the military’s decision to align its policy with the new Guam law that raises the legal age for buying, possessing, using and selling cigarettes and synthetic electronic smoking products until our youth are 21. The military has demonstrated that in some aspects, it does want to adhere to a “One Guam” policy.